Intent: To create a caffeine stim. Allegedly allows for a heightened sense of focus and alertness. An offshoot of traditional Caf, the Caf Stim was created as a way to easily ingest a high concentration of caffeine in a short period of time. The item itself appears as a standard, no-frills stimulant injector that is properly labeled to identify the contents. It is recommended that the stim be applied intravenously instead of into the muscle. 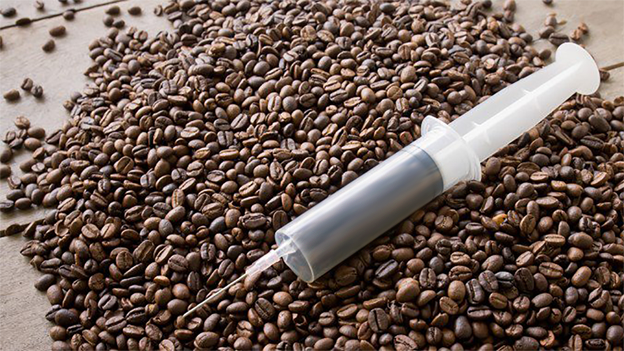 The liquid within the stimulant injector itself is a light translucent brown, derived from caf beans. Once injected, the stim can take anywhere from 15-60 minutes to take effect. It should be noted that all effects of the Caf Stim depend heavily on the user’s caffeine tolerance, age/weight and race. Someone who has a low caffeine tolerance will feel the effects of the simulant quicker, stronger and for longer while also potentially experiencing any number of side effects. Conversely, someone with a higher caffeine tolerance may need to use a bigger dose to achieve the same effect. The full effect of a Caf Stim can last anywhere from 4-18 hours depending on the user. Most users experience an increase of energy along with the ability to focus and heightened alertness. These effects are by no means anywhere near the superhuman realm—rather it attempts to temporarily replicate the effects of a good night’s sleep and a proper diet. A number of side effects may occur with the Caf Stim. Minor side effects may be but are not necessarily limited to heart palpitations, anxiety, jitters, digestive issues and frequent urination. Insomnia, addiction and high blood pressure may occur as longer term effects after frequent use. The more frequently the Caf Stim is used, the higher the user’s tolerance will become. The Caf Stim is available in several different doses.